I’m not a snow person. I don’t like snow that much. I like an environment I can get around in easily, walking. I like warm breezes and greenery. I like comfort. My first experience of snow was during a school trip – also my first experience of being away from home. When I packed my bags for that trip, my Nanna gave me a very sensible pair of beige suede flat lace-up shoes so I could go hiking with ease. I never wore those shoes the whole time I was away, having deemed them very unfashionable. Instead, I wore the long black pvc boots with chunky high heels and lace up hooks all the way up the front, that I had saved up to buy from my pocket money and were considered to be the ultimate fashion accessory of the time. (It was the 70s). So when the class went walking up the mountain after getting off the bus from our hostel, I hobbled along on my high heels, trying to keep up, and got a lot of looks from my classmates that were not anywhere near admiring but made me feel very self-conscious and ridiculous, instead. It’s just as well that half way up the dirt road we were walking on, someone had overflowed a giant washing machine full of suds, that bubbled through the trees and over the grass. It looked like that, anyway, and that was my introduction to snow. I was soon throwing snowballs at my friends and bogging my legs deep in holes hidden in the snow, which reminded my teacher to lecture us all on the hidden dangers of walking off the beaten tracks. Despite that experience being new and amazing, though, my best memories of that school trip away were of sliding down the corridors at night on our dressing gowns that we used as rugs beneath us. By golly, you could get up speed on those shiny floors! I really much more enjoyed climbing up the smaller and green forested hill behind our hostel than I did going up onto the snowy mountain. I had a Robin Hood in the green woods spirit, not that of Heidi on the mountain. My husband was born in Austria. His parents were Europeans who spent a lot of time in the snow. I was regaled with stories about their lives with snow, of using snow shoes like big tennis rackets to walk to school from their homes in the mountains as children, of old wooden skis that were large like old wooden surfboards, that took them on marathon journeys across the mountains as young adults in the way others might process a cross country walk in verdant hills. It all sounded so romantic until they took me with them to the snow. Going to the snow is not as easy as walking out your door in the thick of winter, in Australia. Going to the snow is a day trip away, heading up wet mountains on muddy roads to get to the slush. Yes, slush. Australian snow is not powdery like European snow. It’s icy and can be hard. If you fall in it, you aren’t falling into an icy feather bed. It can hurt. The granules are chunky, like tiny bits of quartz glistening in the sun. All my husband’s family went to the snow every year during winter. They were good skiiers. My then eight year old sister-in-law would glide down the huge mountain without any stocks. They were amazing to watch but you couldn’t get me on skis. I did try, once, but skis were just not for me. I was too afraid of getting hurt. It wasn’t so much the falling, since the snow made the mountain look like a big smooth slide downhill. It was the falling at speed that I was concerned about. When you fall at speed, bones don’t like it. So apart from a couple of lessons where I couldn’t even keep the skis from slipping out from underneath me, I spent most of my time on those excursions waiting for my husband to come find me. It’s good that I’m a very patient person and get a lot out of just watching others, because I often waited all day long while he went up and down that mountain slope with his skis. He thoroughly enjoyed himself. Which was just as well, since skiing is a very expensive sport, especially when you factor in the costs of catching the ski lift. 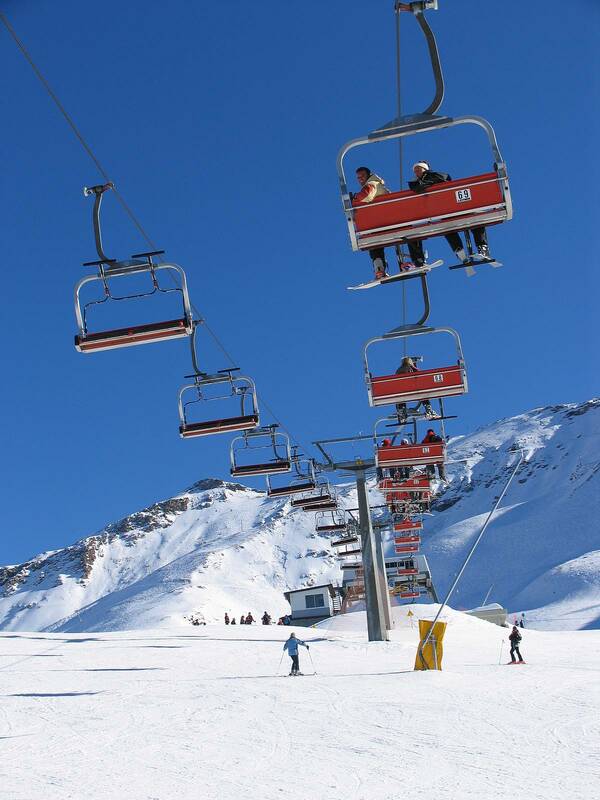 I don’t know how it works in Europe but in Australia you are charged for using the ski lift, and the icy snow is so difficult to traverse up hill that using the ski lift is really the only way to get to the top. I did have some fun other than waiting, though. I drank hot mulled wine – yum! I made snow men. I used a sled down smaller hills. I don’t know why using a sled didn’t frighten me so much. Maybe because sleds were kind of like a go kart and I knew go karts from my childhood. You used a rope on a sled in much the same way you used one on a go kart, and the only difference seemed to be that one slid on its bottom and the other had wheels. When I couldn’t find a sled, I sometimes slid downhill on a plastic garbage bag. That stopped when I slid downhill into a large chunk of log hidden in the snow. Garbage bags do not give you the same protection a sled does. I had a terrible bruise for ages from that meeting. So I did have some fun in the snow. I made the most of the time when I was there. I didn’t just mope around. It’s just that for a lot of the time I was on my own while the others gathered higher up the mountain, together. It’s not quite the same having fun by yourself. If I think back on those feelings, though, I do realize that skiing is not a social sport, either. You don’t hold hands with someone as you speed downhill. It’s a solitary process. So my feeling of being alone, then, was only relative. We went up to the mountain one year when I was seven months pregnant. it wasn’t that I really wanted to be up on the mountain watching my husband enjoy the snow when I was feeling like an elephant with wind. I just didn’t want him to miss out on having his annual fun. I was rugged up in a thick mohair coat but I was cold the whole time I was there, hanging around as usual, watching and waiting. He told me that he was hot as hell. The sun was bouncing off the snow and making him sweat. Of course, he was also being active and I was sitting around like a little fat buddha. My back ached and all I wanted was to put my feet up somewhere that wasn’t damp, wasn’t slushy, and wasn’t cold. I didn’t tell him that, though. I enjoyed seeing him enjoy himself. I liked to see him feel that he was engaging with some part of his heritage, his family history. Don’t all Austrians ski? After our kids had grown up enough to not have to be carried everywhere we went, we also took them up to the snow. I think I did that mainly so that they, too, could grow up knowing some of the traditions of their father’s family. I rugged them up well in snow suits and moon boots, and their little pink faces glowed rosy as they played in the snow, but they never got on skis. By that time, the costs of using the ski lifts had become exorbitant for us and we could not afford the equipment, anyway. My husband rented some skis and went up the slope a few times but mostly we played together as a family, made snowmen and used sleds. Looking back on photos from the time, we looked like we had fun. Eventually, though, the ski trips stopped happening. It was too much cost and we lived too far away to make it worthwhile. In those days, we didn’t have the income to support such extravagances. So, for all my efforts toward giving my husband an annual keep-in-touch with his heritage and family past, going to the snow came to a stop. Years passed and we never went back. Life moved onto other thread lines and even when there was enough money, we spent it on other activities that were more relevant to us at the time. My husband thought back on those events with fond memories but he didn’t dwell on them. Often, in life, we make sacrifices for others. We accommodate their needs and desires because it gives us pleasure to make them happy. The word, sacrifice, comes into the equation because when we do that we are not doing what we would choose to be doing for ourselves if we were not considering others. I didn’t choose to be in the snow. I learnt early on that snow just wasn’t my thing. I went to the snow for my husband’s sake and for my family’s sake, and for the sake of long traditions. Making those sort of sacrifices is not a bad thing, because it is something that is given from the heart, and it is an inspiration of love. However, such sacrifices don’t always come with rewards. We don’t always get reciprocation for the efforts we make on behalf of others. We don’t always feel good about the sacrifices we have made when others take those efforts for granted, either. Such sacrifices don’t always bring permanence in situations, just like the family traditions I tried to carry on weren’t able to permanently embed. Quite often such efforts are only able to be temporary and can only pertain to the periods in which they were made. So results from such sacrifices are not necessarily ongoing. There’s no point in dwelling on the past – the what ifs and wherefores. The past is only good for reference if something is happening now that you need to find the source of, like the root cause of some present predicament. Memories, on the other hand, are what we make them. We had a good time for a while, and even if my family no longer go to the snow they at least have memories of having been there, and the fun times that went with those visits. Just for that, my sacrifices were worth the effort. Life has moved on and other things became a higher priority. We didn’t stop enjoying life just because we no longer went to the snow. We found other things that made us happy and we created new family traditions that replaced the old. All is well and good in the end.